"Hold on to them when they are little. The next thing you know, they will be all grown up." Book a photo shoot today to savor your most precious moments with your child. Photo shoots can be done anytime during the pregnancy (before baby bump, 3 months, 6 months, and 9 months), or anytime after the baby is born. I service the Saint Louis/ Saint Charles area in Missouri, but other locations can be arranged. Photoshoot will be held outside at your location of choice or at your house. 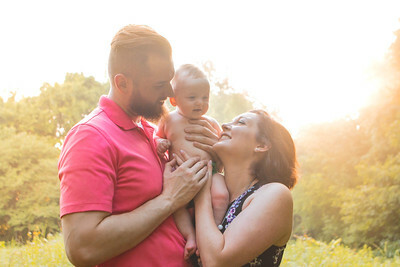 Newborn photo shoots will are $180 which includes an hour photo shoot, a flash drive and an online album of the edited photos, and full copyrights. Ask about discounts when doing multiple photo shoots in the year. It's important to get all the close-up shots! Capturing special moments between the child and parent!